2019 is off to a good start with a few notable openings across all budgets. It's mixed line-up with everything from mod-Asian celebrity chef Alvin Leung's second outpost in Singapore, to a stylish brasserie that’s home to hearty Mediterranean fare and a notably extensive wine collection. Move past the izakaya’s complicated narrative of Chi Kinjo, a fictional character who grew up in Kyoto’s past, and you'll quickly notice a menu elevated with interesting cocktails. The kitchen is led by talented Lamley Chua, who changes things up with modern Japanese offerings; think tuna roll with a touch of spicy sauce and bonito flakes, and salmon and foie gras nigiri. As far as group chief bartender Sam Wong is concerned, the highball is the name of the game. And he's got some cleverly delicious recipes to boot, such as the Shiso Watermelon, concocted with shiso sake and calamansi and watermelon juices; and Sweet Pear Tanqueray which features a base of Tanqueray gin. It’s easy to be mesmerised by this brasserie’s stylish Art Deco look, which serves as the perfect backdrop for inspired European fare, prepared with Mediterranean cooking techniques and only sustainably sourced and organically grown produce. You’ll taste the quality and freshness in every dish—from the seafood platter brimming with ocean treasures like lobsters, oysters and prawns, to classics dishes such as beef tartare, French onion soup and lobster bisque. The meal is complemented by a strong wine collection of over 1,500 bottles. Privacy is such luxury in this day and age, which makes this new dining option a welcome change. The restaurant's location in a shophouse along Jalan Besar adds to its unique charm, while the menu champions the use of fresh produce. Leading the kitchen is British executive chef Steven Snowdon and consulting chef Frances Lee, and the two collaborate to transform humble ingredients into palate-pleasing dishes, such as the Prawn-Star, a platter of jumbo prawns cooked sous vide then blanketed with cauliflower cream and shrimp bisque. The Golden Duck is an ode to Singaporeans' love for duck, and the poultry is cooked sous vide and artfully laden on a plate with a slab of foie gras, carrot cream, chutney and pickled blackberries. There’s more to Demon Chef Alvin than the X-treme Chinese cuisine he famously serves at his three-Michelin-starred Bo Innovation in Hong Kong. He also excels in putting a modern spin on popular Asian fare, which is what he’s showcasing in his latest Singapore outpost. The globetrotting chef takes inspiration from his extensive travels around Hong Kong, Singapore and Malaysia, to name a few, learning about their culinary identity through heritage dishes, before creating his own interpretation. The humble laksa, for example, is elevated with premium ingredients like chargrilled tiger prawns, jasmine-tea smoked onsen quail eggs and housemade dried shrimp floss, served in a heady and coconutty broth. 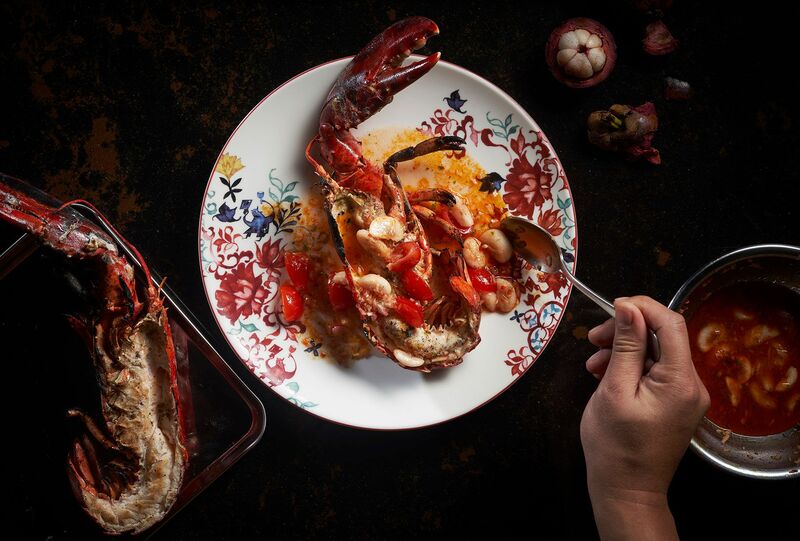 Without losing its essence, the chilli crab is elevated with the use of Alaskan king crab, doused in a sweeter sauce that complements the buttery cornbread the dish is served with. The restaurant is named after the daughter of Berthold Kempinski, founder of the Kempinski chain of hotels. It aims to be your ‘home away from home’ with three distinct spaces you can relax in no matter the time of the day. The Frieda’s Day Bar is made for casual afternoons with friends, made better with ice-cold German beer available on tap, while the botanical-themed Frieda’s Garden and the intimate dining room are perfect for date nights or special dinner with friends. The menu is a collection of traditional German cuisine flecked with Austrian influences, such as the wiener schnitzel (pan-fried veal cutlet) and a side of potato salad and refreshing Gurkensalat (German cucumber salad), and pan-fried rainbow trout with baby spinach and parsley potatoes. A few doors away from Frieda is another German gem, this time serving everything from light lunches such as sandwiches and salads to an assortment of German breads, rolls and pastries. Choose to dine within the beautiful surrounds of this European-style café, and try its signature dark rye sourdough sandwich with pastrami, or the charcoaled brioche with chicken or smoked salmon. If you prefer something lighter, the classic waldorf salad with walnut or the beetroot salad will do just fine. Before you go, make a stop at the deli for fresh, housemade bretzel, bauernbrot (farmer’s bread) or the hefezopf (braided yeast loaf) for your enjoyment at home. Swiss kitchen appliance V-Zug always thinks out of the box—first with its gourmet academy and now, a full-fledged fine dining restaurant that uses their cutting-edge household appliances. The kitchen is led by culinary director and brand ambassador, Ryan Clift, while head chef Lee Jing Peng takes charge of the day-to-day operations. The plan is to change or update the menu every one or two months, served as three- and five-course lunch menus, and six- or 10-course dinner menus, with optional wine pairing. A nod to local fare is also evident. Current favourites include their rendition of the beloved laksa, which is essentially laksa mousse topped with taupok (fried beancurd), dehydrated laksa leaves and coconut cream. There's also a serving of hamachi, flown in from Japan every three days, served with textures of green curry and puffed rice. Named after co-founder-chef Alain Devahive's daughter, the menu here celebrates the inspired, cosmopolitan culinary tapestry the Catalan city of Barcelona is known for, coupled with the keen creative eye of the chef, honed from more than a decade of experience working at Michelin-starred restaurants, including the iconic El Bulli. Hearty, honest flavours inspired by the eclecticism of the Mediterranean coastal city take centrestage, evident in dishes such as the envoltini de bogavante y aguacate, a tribute to the avocado-lobster roll from the now-defunct Catalunya Restaurant that Devahive once headed, and the lomo de buey wagyu con salsa de trufa y piminetos del piquillo confitados—a succulent wagyu striploin paired with truffle sauce and confit piquillo peppers. To boot, the expansive selection of Spanish and international wines, curated by chief operations officer-sommelier Miquel Sabrià, is equally mouth-watering.